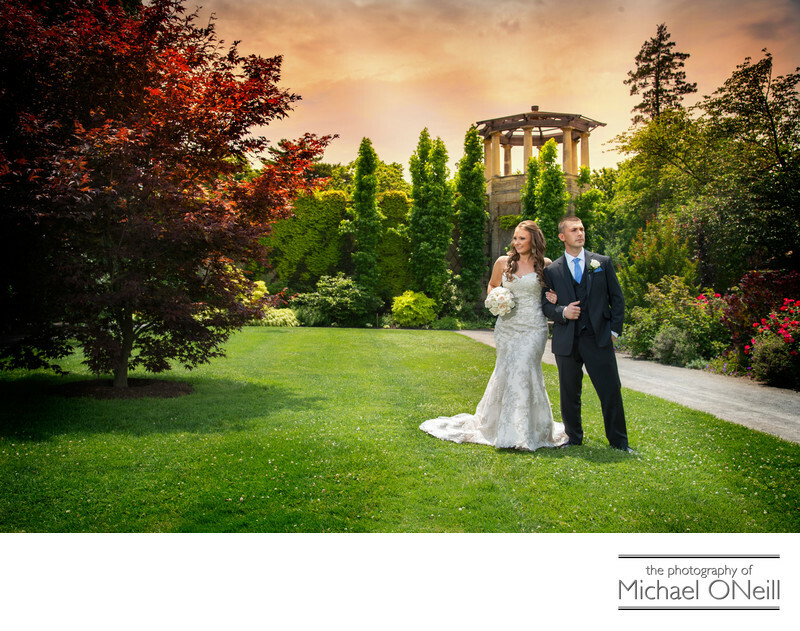 Yet another striking wedding photograph created on the grounds of Untermyer Park and Gardens located in Yonkers, New York. This breathtaking property is located just 20 minutes north of New York City and provides an awesome alternative to the crowds and frenetic pace of New York’s Central Park. The park features dramatic architectural elements and numerous reflecting pools with bridges. For those willing to tackle some intimidating stairs there is a panoramic view of the Hudson River. A rock garden just a few steps from the main parking area is a great spot for some bold wedding environmental photographs. I had such a great time with this bride and groom. Their wedding photographs were very important to them and they gave me lots of time to wander around the park and take advantage of all the great spots. If you’re planning a trip to Untermyer Gardens for your wedding photos be sure to choose a photographer who knows his or her way around the grounds. The park has challenging lighting conditions but an experienced wedding photographer, working with a skilled assistant, will know how to make the most of this incredible venue.